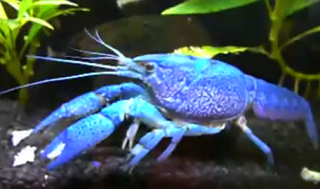 Crayfish or sometimes called Yabby (Yabbie) is usually a favorite among freshwater hobbyist as they are normally introduced to an aquarium not just to add variety to the freshwater inhabitants but they also play a part towards scavenging and cleaning up unwanted leftover foods. Crayfish does not resemble or look anything similar close to a pet fish as most people would easily get confuse with but in fact, it is more like a freshwater lobsters and it can be bluish in color as in the electric blue crayfish or it can be red as seen with the red claw crayfish. Crayfish are found everywhere in almost every continent and depending on which type of species, their size can be as small growing up to only 3 inches in length while the largest reach more than 1 feet and above. Crayfish are normally added to the tank when they are small but once they reach a certain maturity size, they are best taken out and put in a solitary confinement with one crayfish per tank or in groups with only your pet being the single species. Crayfish are notorious for fighting with each other, sometimes up to the extent of losing their claws and if you put crayfish of different sizes, usually the smaller ones get bullied and become malnourished and stay that way the same with that size. One advice that I would have for new starters or beginners is that never add them to a community tank full of small fishes such as guppy, neon tetra or danio, else you might find your fish numbers starting to dwindle in no time. Usually the best companion for them would be either gourami (banded, pearl or even dwarf) which can dart away fast enough or cichlids which are bold enough to fend for themselves. While I’ve also seen certain people mixing them together into a red tailed black shark tank and also on one occurrence which I’ve seen the crayfish staying together with black ghost knife fish, but however, not sure what’s the outcome would be like as time goes on. Place close observation though because sometime it is not your pet fish that ends up becoming the victim in the food chain, but it’s your crayfish getting eaten up especially when they are extremely vulnerable after molting. Never put them together with Oscars though. Crayfish feeds on almost everything from vegetable leaves for example spinach, carrots, algae wafers and if you want to supplement the diet with meaty foods for faster growth, you can also use fresh market shrimps and fish fillets. However, I rarely go to the extent of providing them a specially prepared diet unless it happens once in a blue moon because the main idea on why I have it there in my 100 gallon aquarium is to become the cleanup crew. Anyway, nowadays I’ve also seen packed flakes and dried pellets sold in pet stores which are meant specially to feed for your crayfish. Tank setup for your pet should be pretty much straightforward. One thing obviously they need is a tank full of large gravel and pebbles so that they can occupy their time moving around to form their home. Sometimes hobbyist go to the extent of creating artificial hiding place using cut out pipes, coconut shells or even aquarium caves which you can buy from pet stores. If you intend to grow live plants in the tank, make sure that you choose to use those hardy large leaves type or else your crayfish will tear them apart easily. Finally, your pet crayfish will breed naturally if all conditions such as clean water source with rich diet is available and as such I would recommend getting a filter even though the water will not get dirty easily. So far, I’ve met few individuals who are so successful with their crayfish care that they even set up a small farm to house and breed the invertebrate for commercial purposes.